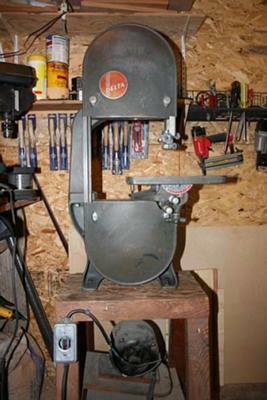 I have just aquired this bandsaw, came with a bunch of machine shop tools, It is in pretty good condition but could use a couple of new parts prior to using it it my home workshop. Problem is I can not identify the model number, I have called Delta and given them the serial number ( 10-4277) they were also unable to tell me what the model number is. All of the casting numbers and part numbers start with TBS, the cast mark TBS-10 is on the main upper casting. I also have a 14" Delta saw in my business and I think that some of the parts will interchange, but I also have a full machine shop and can fabricate anything I can't buy. I would like to try and find a manual if possible just because I am geared that way. Any help in identifying this nice old saw would be greatly appreciated as I intend to use it for a long time. It appears that you may have a Delta No.768 or No. 777 Band saw. I found an old Delta Machine catalog @ www.vintagemachinery.org that shows yours and my saw as this number. My saw has the metal stand with it and the stand has Catalog No. 329 on the ID plate as per band saw No.777 in this catalog.